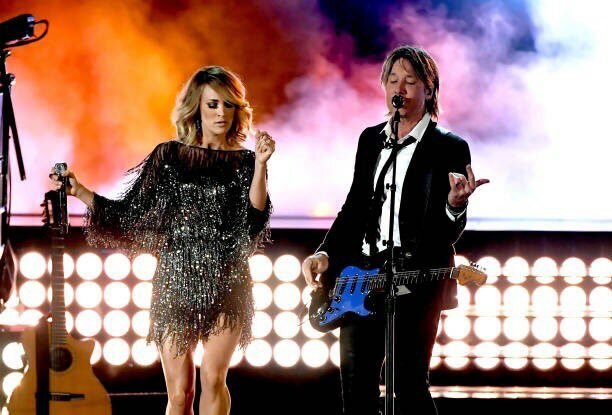 Country superstars and multiple nominee Keith Urban and Carrie Underwood, joined forces once again for a performance of their collaboration "The Fighter" at the 2017 Academy of Country Music Awards in Las Vegas on Sunday, April 2nd. Jason Aldean - "Lights Go Down", Luke Bryan - "Move", Florida Georgia Line - "H.O.L.Y. ", Carrie Underwood - "Church Bells" & Keith Urban - "Wasted Time"
Jason Aldean - "Any Ol' Barstool"
Keith Urban with Carrie Underwood - "Blue Ain't Your Color"/"The Fighter"
Little Big Town - "Happy People"
Kelsea Ballerini - "Yeah Boy"
Thomas Rhett & Maren Morris - "Craving You"
Florida Georgia Line with Backstreet Boys - "God, Your Mama & Me"